I should confess now that we're bunch of geeks in this family. However, it's not an excuse for what we do almost everyday. A kind of a current lifestyle trend we all live and are predisposed to in this generation now, but it's still very bothersome in so many levels, it should be a crime. And yes, WE'RE ALL GUILTY of it. How dare we? We should be hanged for our transgressions if hanging was still a thing today. If you're conscious - or are you not? - you'll more than notice that with the immersion of technology in our lifestyle and everyday living, personal face-to-face interaction is becoming or have become a luxury. It's almost a thing in the past. Quite common nowadays, it's about widely accepted as "normal" even in our own homes! It does bother me though, doesn't it, you? "It upsets him so much, he banned the use of smartphone in his presence, be it in the house or car, and to simply enjoy face-to-face interaction with him and with each other!" We were at a restaurant one time and there was a family of three like us, waiting to be called in at the waiting area. We were all seated quietly minding our own business when the family of three across us started conversing just like families do, but, there was one huge issue in the whole scenario. Can you guess? Well, I'm sure you have a good guess but I'll tell you anyway since that's my job right now. As they were "talking", none of them looked at each other, not even once. They were all bowed down phubbing as they speak! This went on until they were called in. It was almost like watching robots interacting with each other! Then just the other night, I was at a party and had the rare opportunity to speak to a gentleman who is in his 80's. He touched on the subject of smartphone use and the effect of phubbing - and how very offended he gets EVERY FREAKIN' TIME - his word. This occurrence happens a lot as well when his son's family come for a visit. He said, it upsets and offended him so much, he banned the use of smartphone in his presence, be it in the house or car, and to simply enjoy face-to-face interaction with him and with each other! I couldn't agree more, could you? "I have countless times when I truly would like to turn into the Green Hulk or The Thing, and hurl him across the room with his beloved smartphone and just scream at him!" Truth be told - I, myself, is not exempted from this techno-crap assault. I'm as guilty and a victim as well. As such, I have certain times when I do take real offense. Times like when I'm talking to my husband about something that I deemed really important, and I want his full attention - meaning, looking at me while I pour my heart out - only to see him fidgeting on his phone and phubbing! Instances like these makes me so mad inside, I have countless times when I truly would like to turn into the Green Hulk or The Thing, and hurl him across the room with his beloved smartphone and just scream at him! Don't you feel that way like me, some times? Then there's my kid...don't even dare start me with kids whose phones are attached to their bodies like it's one of their organs. Like anything, if there's a beginning, there's an end. If there's a problem, there's a solution. However, if you're not willing to make a change, then you're pretty much stuck in limbo - doing the same crazy thing over and over again. As for us, we've all reached our limits and decided to take action for our indiscretions. My family of three decided to make one simple rule that we all need to abide by. NO PHONE ALLOWED AT THE DINNER TABLE. No exemption. No excuse. Guess what? We all survived. This change also got us more aware of how we interact with others and to actually look at someone else's eyes while they or we speak, to show that we are ACTUALLY listening - and being respectful - by giving our 99.9 % attention. 1% is for looking away once in a while or glancing at our phone because c'mon! we can't help it. 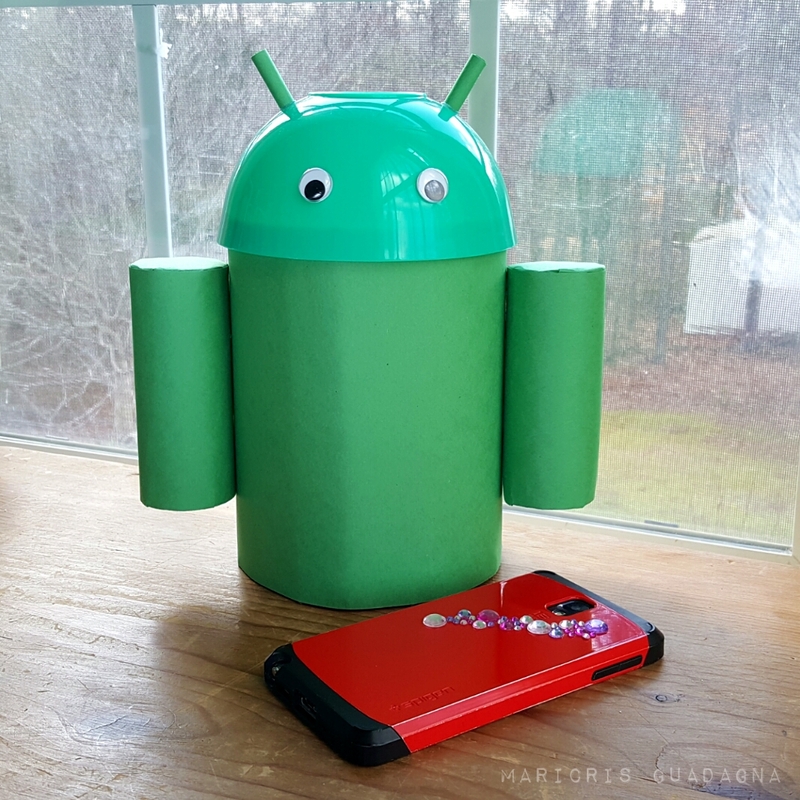 Create a smartphone coop like this one I created. It was inspired by Chick-Fil-A's Cellphone coop. Mine, I called it my Android Coop. And then make your own personal rules at how you would want to implement your coop. 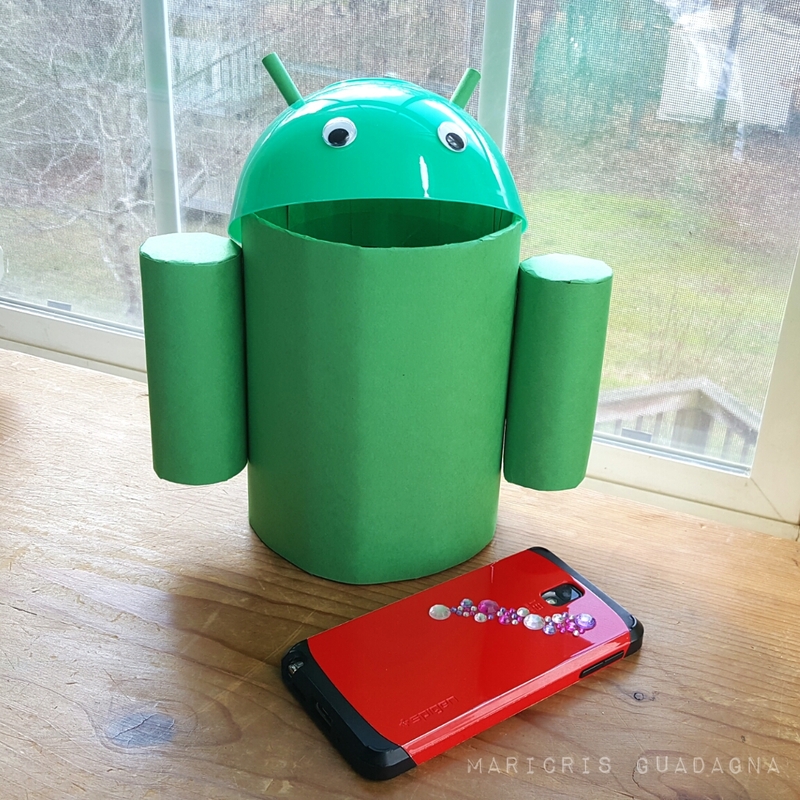 My Android coop is a simple, easy DIY project made from plastic bowl, toilet paper inserts, cardboard and construction papers that can be done in less than 30 minutes. Create the body. Shape the cardboard box flap into a round form sized 5 1/2" x 7" (perfect size for my bowl). Tape the edges together. Trace the size outer edges of your round form on another cardboard sheet and cut that out with allowance on the edges. Cut the edges 1/2" apart and all the way through the edge of the outlined mark. Fold it and adhere it to the inside of one of the opening of your round form to serve as the bottom part. Then cover the body with the green construction paper. Tape paper edges to hold in place. Set aside. Do the same thing with the toilet paper inserts. Make sure to cover the hollow top part first, then cover the rest of it with the construction paper. Hot glue them on each side of your android's body. Cut 2 pcs. of 1 inch strip of construction paper and roll tightly. Tape or glue it close. 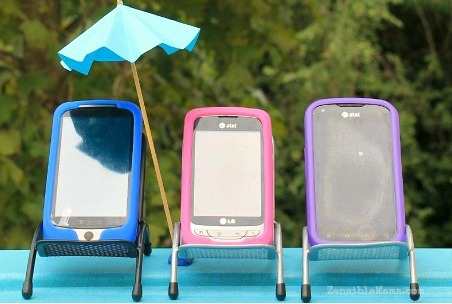 This will be your android's antennae. Hot glue it on top of the plastic bowl. Followed by the eyes! Put the bowl on top of the body to serve as the lid. That's it! What is your biggest pet peeve on gadget use?